From the corner of an office to the cornerstone of the community. The library has been the cornerstone of the community for some time, but that’s not always been the case. In Tipton County, the public library started off small with only 45 books, but it has grown to include so much more including STEAM Learning, a 3D printer, and countless online resources. The first library in Tipton County was in a corner of the County Superintendent’s office in the log court house. Sometime after this, the state made provisions for a library in every county seat, with each county having the same selection of books, regardless of population. J. S. Ressler was the first librarian of this library, which began with 45 books. Funding for the library came from a 10% portion of the proceeds of the sale of county lots. This library later closed because there is no other mention of it. In March, 1901, Mrs. Ida Matthews led a discussion at the Literary and Suffrage Club in Tipton on the need for a library. Plans were made to set up a public library. A state law went into effect the following year to organize libraries and allow citizens to tax themselves for this purpose. Tipton was the first Indiana city to take advantage of the new law. Mrs. Matthews was appointed librarian in December of 1901. She held a book shower that same month at which 237 books were donated along with $472 to purchase additional books. With books costing between $.30 and $6.00, the donations brought the total number of books to 777. They were stored in a glass case in the county superintendent’s office on the third floor of the courthouse. The library officially opened March 11, 1902 and was open two days a week. Around the same time, Andrew Carnegie donated $10,000 to build a library in Tipton, and the city pledged $1,000 annually to maintain it. Choosing a site for the building proved to be controversial but it was decided to build where the Gilbert house stood, so the library would be in a “beauty spot.” The house was sold and moved with the stipulation that no trees would be harmed. Each tree in the park surrounding the library was considered a memorial and a chart identifying each one was hung in the library. The present library was built on the same site. Mrs. Matthews ceremoniously laid the first brick of the new library and it opened on March 22, 1903. There were two fireplaces, stained glass windows, and a stage for plays and programs. Furniture was needed, so Mrs. Matthews wrote to Andrew Carnegie. His reply was curt and negative. Finally, Mrs. Matthews sent a silver library spoon as a gift to Carnegie’s daughter, and received a check for $3,000 for furnishings. The Tipton library was one of the least expensive that Carnegie underwrote. Mrs. Matthews continued as librarian for 41 years until ill health forced her to retire in 1942. In that same year, the county commissioners voted to make the library county wide. Thereafter, branches were opened at Windfall, Goldsmith, Sharpsville and Kempton. For several years a bookmobile delivered books to county schools until each developed its own library. There was once a bit of lore associated with the Tipton Library and the stuffed bear cub that used to reside in the Children’s Room. The lore says that Dr. Robert Collins went hunting with a group of men in the 1960’s and one of the party shot a black bear. The hunting party later discovered the bear’s cubs and Dr. Collins brought one of them back to Tipton and had it stuffed. In 1967 the bear was loaned to the Children’s Room where it became a mascot. Because of all the loving attention it received, the tail fell off and the chest went bald. It was a favorite with the children and remained a fixture in the department for twenty years. It has since been given to the Tipton Historical Society for preservation as part of Tipton’s history. The Carnegie building served as the library until 1981. During its latter years the building suffered structural damage and, unfortunately, had to be razed. The present library was completed and opened on March 14, 1981. The newer building incorporates parts of the older building, including: woodwork and columns from the Children’s Room, stained glass windows framed and hung as artwork, and the beveled glass window from the adult entrance. Tables from the old library are still in use in the current library. Mrs. Ida Matthews, the first County Librarian, was a firm believer in progress. Her action supported her beliefs, for she was a strong force for the arts and education in Tipton County. Born Ida Elliot at Jackson Station (north of Tipton) in 1869, she was educated in county schools. 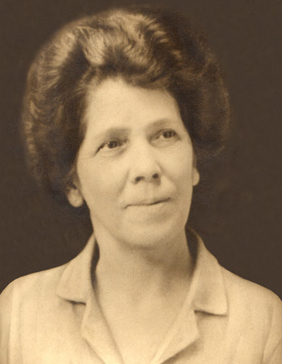 Her interest in education continued throughout her life with her involvement in the National Chautauqua (an educational organization of the time), and through university course work. She was admitted to practice law in the Tipton Circuit Court. Mrs. Matthews is best known for her untiring efforts to establish the local library. This “promoter of library services” held the first book shower in 1901 and in 1902-1903 single handedly secured a total of $13,000.00 from Andrew Carnegie for the first library building and furnishings. She held the position of County Librarian for 41 years. Mrs. Matthews was active in a number of local, state, and national organizations. She held membership in the American Art Association, American Library Association, National Editorial Association, the General Federation of Women’s Clubs, and the National Chapter D.A.R. State affiliations included the Hoosier Salon, Women’s Democratic Club, Indiana Historical Society, Nature Study Club, League of Women Voters, the Indiana Federation of Women’s Clubs, and the Alpha Chapter, Epsilon Sigma Omicron Honor Society of the Federation of the Women’s Clubs. She held office positions or was a delegate to conventions for a number of these organizations. At the local level, Mrs. Matthews organized the Tipton County Art Association and the Tipton County Historical Society, and was president of these organizations for a number of years. She was also involved with a number of other local educational and cultural clubs. Want to learn more about genealogy?